My guess is that your mom is dabbling in some variety of postmodernism. 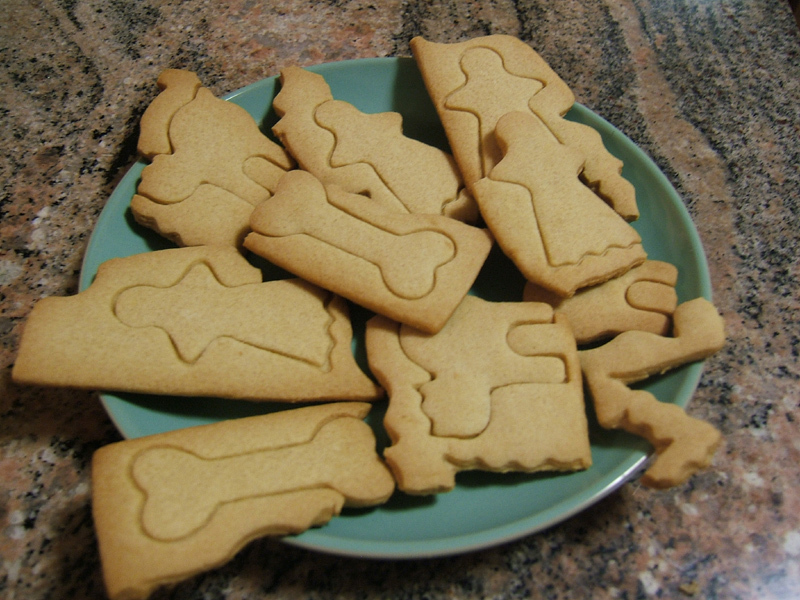 By fragmenting the cookie gestalt along a set of subjectively determined fissures that cannot be reconciled with the rationalistically imposed boundaries between cookie "self" and cookie "other," she has essentially deconstructed the sheet of cookies into a paradigm that is manifestly at odds with the teleologically determined "deep structure" posited by the canonical iteration of the cookies. "They" by Micah Lindberg. Photography/Digital collage. 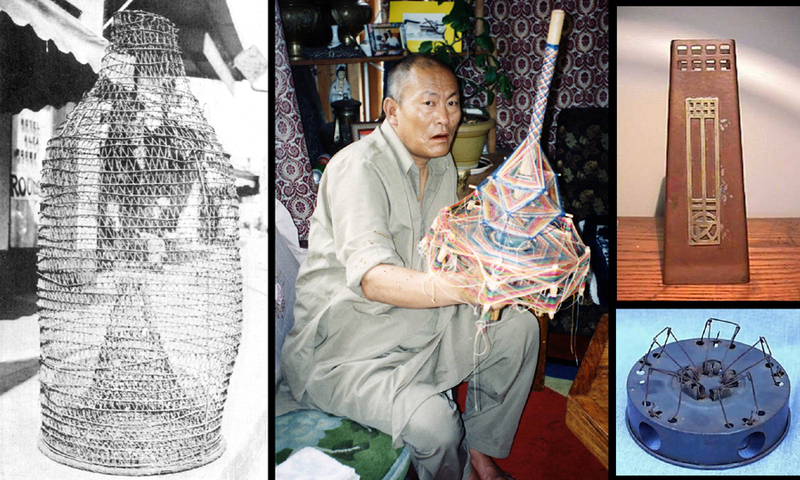 Answers and sources: Left, an octopus trap and shrimp transporter. 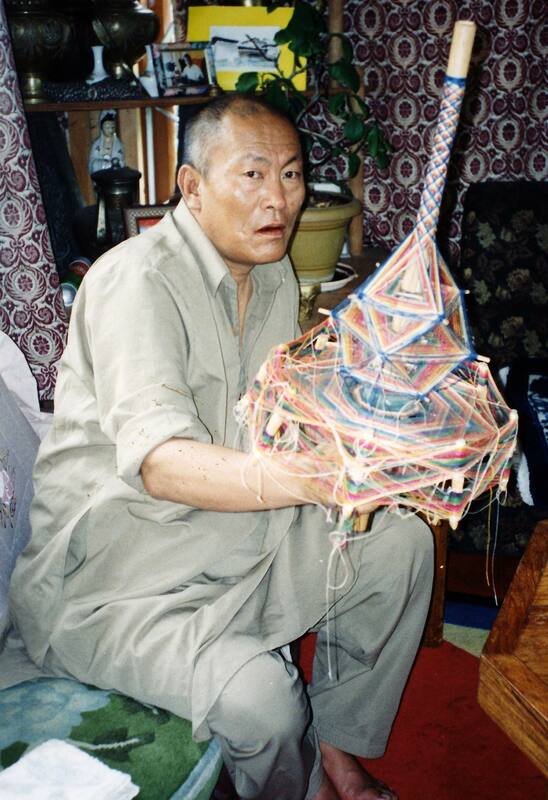 Middle, a Bhutanese spirit trap. 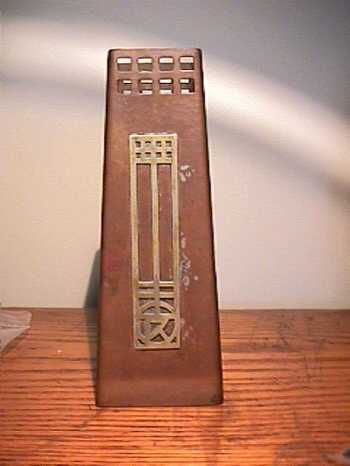 Top right, a rare tapering trapezoidal Roycroft copper vase. Bottom right, an unusual antique mouse trap with five holes. Shrouded in mystery, ghostly apparitions materialize in many subtly haunting colors. Besides deathly white, the specrtral spectrum embraces ethereal violets, cadaverous yellows, twilit blues, midnight blacks, moonlit silvers, and near-transparent yet unmistakable hues spanning the entire night rainbow. The delicate, insubstantial hues of the ghostly realm can add an emotive dimension of wistfulness to any palette, Halloween-themed or otherwise. Charley: Ghost color? Oh, ghost color! Strange white lustres and shadowy blacks are integral to the philosophy of art teacher John Ruskin. He explains: "When white is well managed, it ought to be strangely delicious,—tender as well as bright,—like inlaid mother of pearl, or white roses washed in milk. The eye ought to seek it for rest, brilliant though it may be; and to feel it as a space of strange, heavely paleness in the midst of the flushing of the colors. This effect you can only reach by general depth of middle tint, by absolutely refusing to allow any white to exist except where you need it, and by keeping the white itself subdued by grey, except at a few points of chief lustre. "Secondly, you must make the black conspicuous. 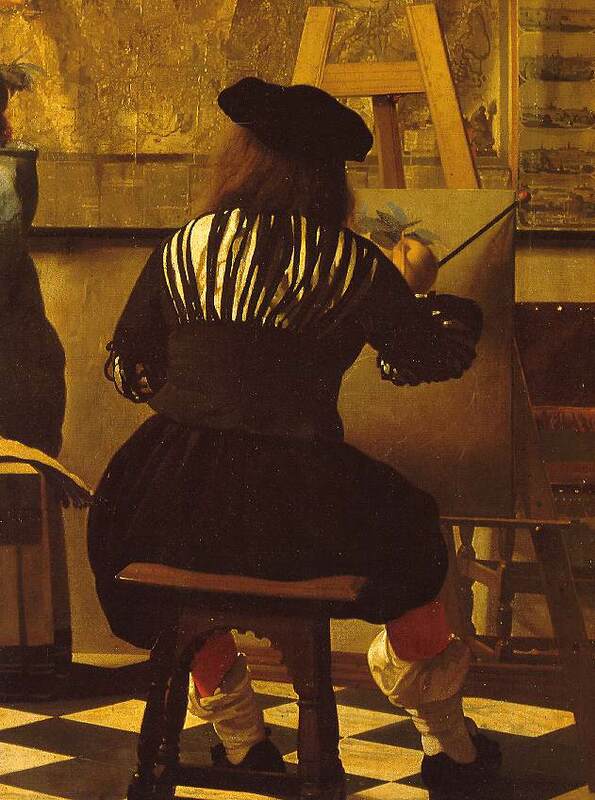 However small a point of black may be, it ought to catch the eye, otherwise your work is too heavy in the shadow. All the ordinary shadows should be of some colour,—never black, nor approaching black, they should be evidently and always of a luminous nature, and the black should look strange among them; never occuring except in a black object, or in small points indicative of intense shade in the very centre of masses of shadow. Shadows of absolutely negative grey, however, may be beautifully used with white, or with gold; but still through the black thus, in subdued strength, becomes spacious, it should always be conspicuous; the spectator should notice this grey neutrality with some wonder, and enjoy, all the more intensely on account of it, the gold colour and the white which it relieves" (The Elements of Drawing, 1857). Back in 18th century London, an ad in the Old Bailey periodical promised a spectacular show for "lovers of curiosities" by the "Moving Skeleton." 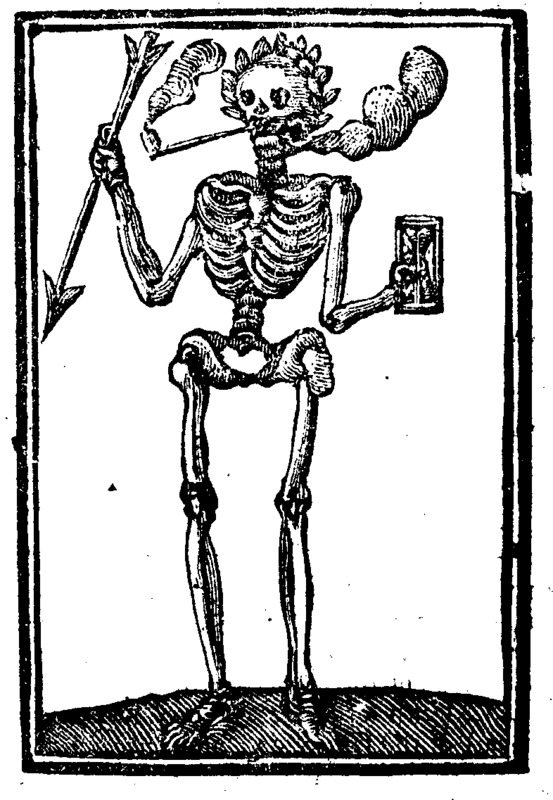 "According to the elaborate illustrated notice, the skeleton turned an hourglass, jabbed a dart and groaned '3 times most surprisingly' to alarm the viewers, concluding its performance by smoking a pipe. An advisory notice was included: the show was too frightening to be seen by 'Persons with Child, Children, or others, whose Courage cannot be depended on.'" —Matthew Seccombe, Harvard Law De Jure newsletter. Piecing together the secret of the labyrinth . . . The glowing Chicago skyline on a moonless night was the inspiration for the "New Moon Chicago" color palette. The photo was taken from the top of the John Hancock building. "EEEEE EEE EEEE is a pleasingly sophisticated work, an unself-conscious yet commanding tour de force about the search for meaning in a culture gone mad with celebrities and advertising." The title refers to dolphins, who squeak "Eeeee Eee Eeee" to express their feelings, notwithstanding their capacity to talk like people. 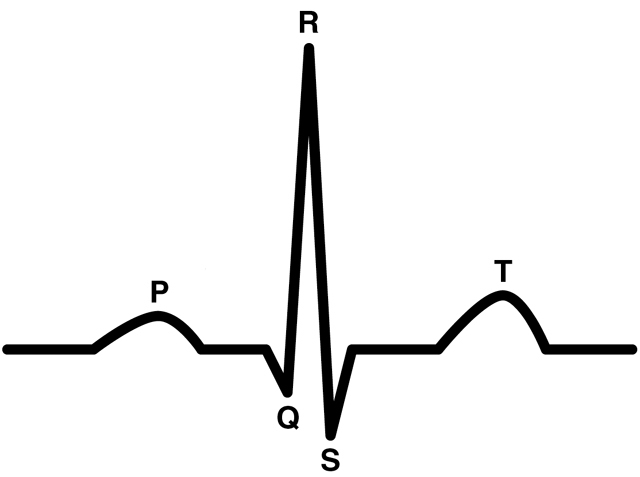 "Now I know my ECG's; next time won't you sing with me?" Popular new names: Banister (for boys) and Runner (for girls), especially step children. Musicians Ryan Shupe and the Rubberband have found inspiration in my Field Guide to Identifying Unicorns By Sound. The band's new album promises to be a sonic exploration with "no limits and no boxes to fit into, just music that mixes everything and anything together to stretch your mind." The band says that the unicorn guide has been "very useful" to their creativity. See their discussion of the album and book here. Piecing together the secret of the Knight's Star . . .
“The Check is in the Mail"
This time-honored delay tactic has been cited as one of the oldest tricks in the book by Wikipedia (2006). The alphabet of Pole Land. I stumbled upon the official Abecedarian Coat of Arms! Q: How did the Buddhist monk choose an apprentice? Piecing together the secret of joy . . . Tension and release. The oldest trick in the book for generating a great performance, drawing us up tight with emotion, filling our hearts with pain and pleasure, then torching the pressure with ritual until we are cleansed, and can continue afresh—lighter, transformed, absolved. Isn't it hilarious that the Weather Channel is listed in TV Guide? As if anyone could predict what's coming up! Here's a watch that depicts a three-day weather forecast. I prefer my own system of throwing jumping beans onto an ancient map of the cosmos drawn by St. Isidore, Bishop of Seville. Then I look out the window and dress accordingly. But that's just me. I contend that Rene Decartes invented the Lotto in 1633. 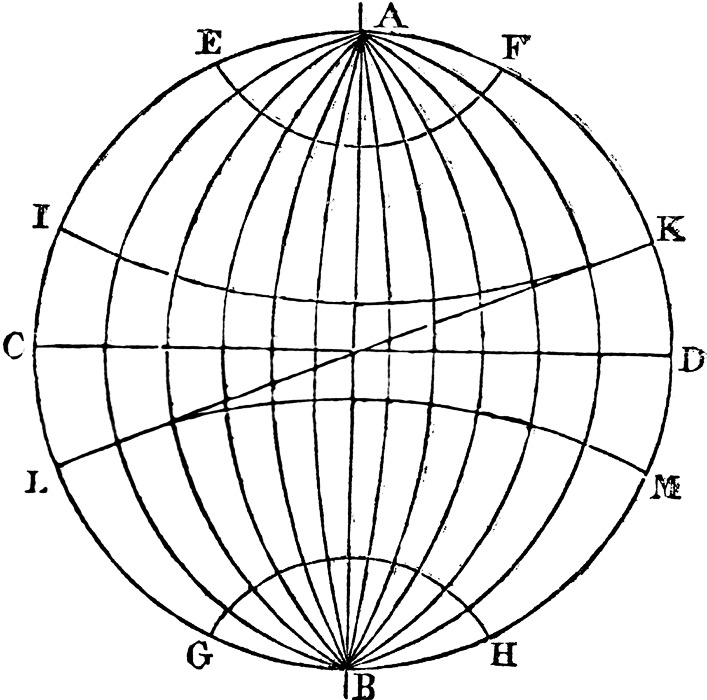 This figure, drawn by Decartes, is my proof, from his treatise The World. Q: How do artists' colonies form? A: They simply draw together. Q: What's the difference between an artists' colony and a nudist colony? A: Nothing, if you can get past the naked models. Square pegs and round holes need not be incompatible. Consider the cube made from 2,222 holes. Full-resolution photo available via flickr. Piecing together the secret of Janus . . . The game of Jenga-Chess. See full-sized photo at Kim's Place. Speaking of Chess, some people apparently play it on the sand dunes of the beach, with giant pieces. For example, here's a black queen (controlled by a bathing beauty) that just took a red knight. Others combine the games of Jenga and Chess, to build ornate towers (see photo). Here are the nuts and bolts of Chess. Just for the fun, I don't know if you are aware that your "bathing beauty" is actually the Female Chess World Champion. Details of the "Crayon Sharpener" palette are available here. There is much controversy among art historians surrounding this stage of Sottise's career, for the simple reason that these works could easily be forged by almost anybody, and no one is quite sure which ones, if any, are authentic. Still, the later, more exotic pieces in this series ('Chartreuse,' 'Raw Umber,' 'Burt Sienna') are fascinating no matter who painted them. But in the fall of 1937, tragedy struck: Sottise ran out of colors and, after exhibiting the 65th and final item in this series ('Crayon Sharpener'), he was forced to enter the next phase of his work. Q: What French novelist carried a wrinkled pouch everywhere he went? Piecing together the secret of invincibility . . . 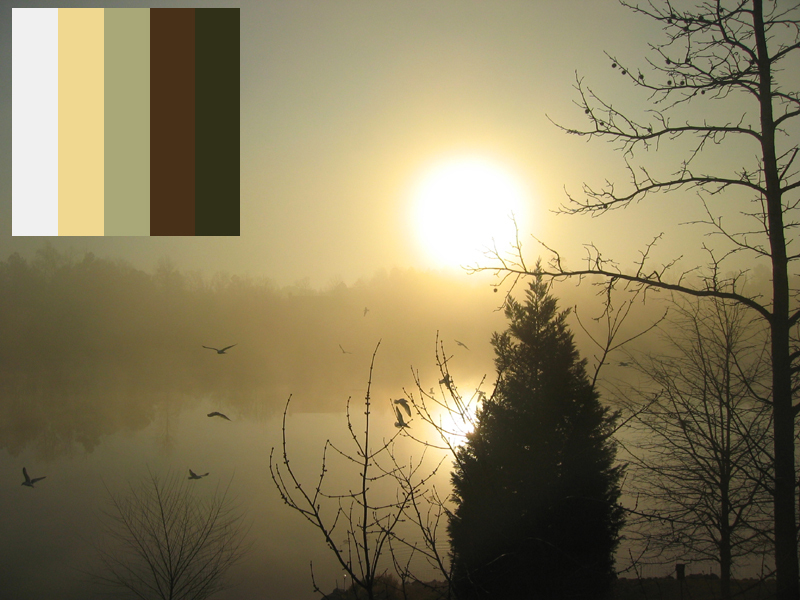 The "Aurora Vapors" color palette finds its inspiration in the sun rising through a lake-effect fog, creating a vaporous aurora. There are eight petals on an implied lotus. Q: Even when he's not playing cards, he has the biggest scores. Who is he? "Use number 2 pencils. Get a good pencil sharpener and sharpen about twenty pencils. When one is dull, grab another. . . .
Write in a hard-covered notebook with green lined pages. Green is easy on the eyes. Blank white paper seems to challenge you to create the world before you start writing. It may be true that you, the modern poet, must make the world as you go, but why be reminded of it before you even have one word on the page? The lines tend to want words. Blank paper begs to be left alone. The best notebooks I’ve found are National 43-581." —Richard Hugo, The Triggering Town: Lectures and Essays on Poetry and Writing, 1979. Piecing together the secret of inspiration . . .
"Well of all the . . ."
"What the . . . !" "Well! I never [. . .]!" "Why, I oughta . . ."
I bleakly stared into the dark void. The most curious and interesting bit of their strange life came out at night, when they were fascinated by my light. I used sometimes to set a candle on a piece of board for a float, and place it in the water close to shore, where the ripples would set it dancing gently. Then I would place a little screen of bark at the shore end of the float, and sit down behind it in darkness. Presently two points of light would begin to shine, then to scintillate, out among the lily pads, and Chigwooltz would come stealing in, his eyes growing bigger and brighter with wonder. He would place his forearms akimbo on the edge of the float, and lift himself up a bit, like a little old man, and stare steadfastly at the light. 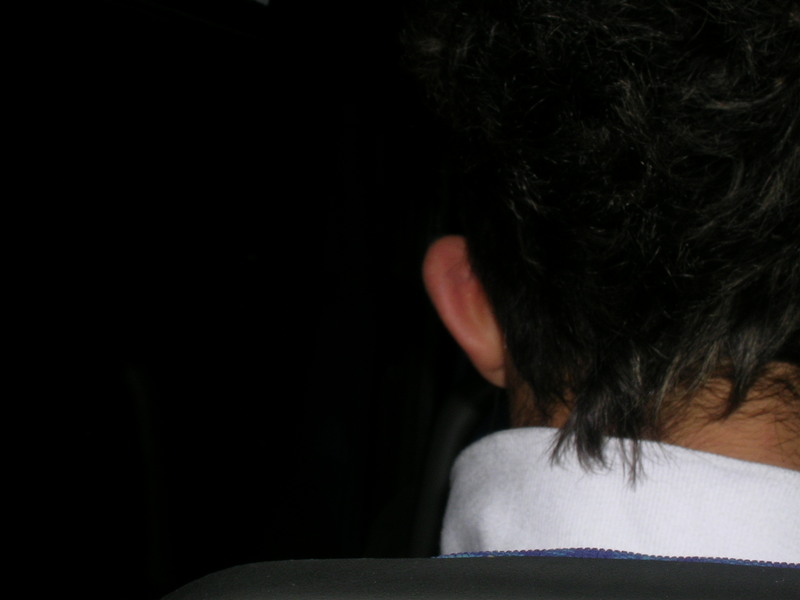 And there he would stay as long as I let him, just staring and blinking. 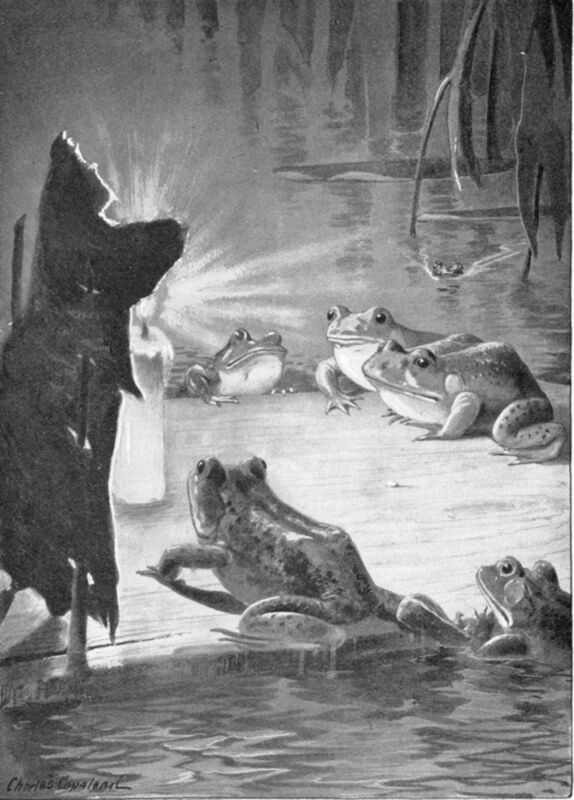 Soon two other points of light would come stealing in from the other side, and another frog would set his elbows on the float and stare hard across at the first-comer. And then two more shining points, and two more, till twelve or fifteen frogs were gathered about my beacon, as thick as they could find elbow room on the float, all staring and blinking like so many strange water owls come up from the bottom to debate weighty things, with a little flickering will-o'-the-wisp nodding grave assent in the midst of them. But never a word was spoken; the silence was perfect. Sometimes one, more fascinated or more curious than the others, would climb onto the float, and put his nose solemnly into the light. Then there would be a loud sizzle, a jump, and a splash; the candle would go out, and the wondering circle of frogs scatter to the lily pads again, all swimming as if in a trance, dipping their heads under water to wash the light from their bewildered eyes. Tears were the oldest trick in the book used by women, yet somehow his usual immunity wasn’t working. Though it has been depicted countless times on stage and screen, the marvelous land of Oz has an original and quite inventive color palette. The genuine colors of the yellow brick road, the field of poppies, the Cowardly Lion’s mane, the flying monkeys, Toto, and the great Emerald City are preserved in the very first printing of The Wonderful Wizard of Oz (1900). That edition of the book is preserved in the Library of Congress Rare Book and Special Collections Division, available for on-line viewing with extraordinarily high quality scans. “The Wonderful Wizard of Oz was an innovative book not least because of the twenty four full color plates and myriad monochromatic illustrations in which the color changed according to the location in the story (Kansas = grey, Emerald City = green and so on). With the illustrative vignettes often encroaching on the text area, the type was cleverly printed over the top of the colored images” (BiblioOdyssey). Thanks to Codename Gimmick, whose word chromonautical inspired this diagram. Piecing together the secret of immortality . 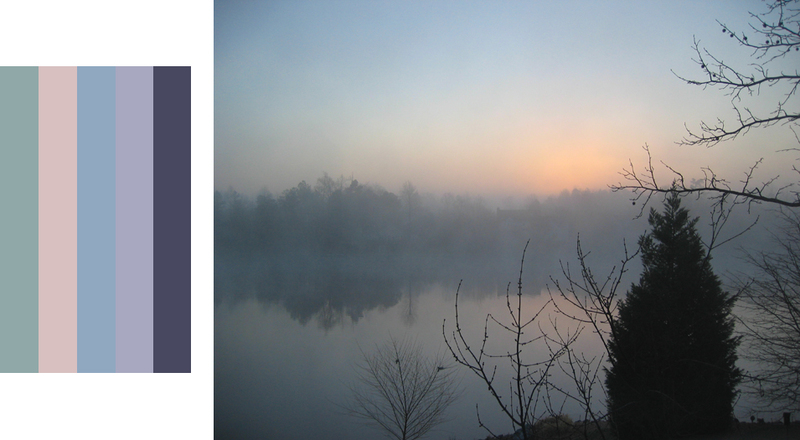 . .
My "Bewildered Dawn" color palette takes its inspiration from the rising sun trying to penetrate a veil of early morning fog on a lake. Though widely perceived as colorless, diamonds are infrequently achromatic and can occur in every hue of the rainbow. In fact, color is one of the four standards for judging the beauty and worth of a diamond (the others being carat, cut, and clarity). When it comes to diamond color, there are two seemingly contradictory principles: less is more, and more is more. The fewer impurities and flaws, the more transparent the diamond and the higher the value. Yet rare colors such as blue, green, pink, orange, and black are highly desirable and even museum-worthy. A faint straw yellow will detract from a diamond's value, while a deep yellow is prized. "White" diamonds are classified according to their degree of transparency. Most white diamonds actually contain yellow or brown tints. The Gemological Institute of America developed a scale of diamond color saturation, ranging from D (colorless) to Z (noticeable light yellow or brown). Diamond color is determined by comparing a gem to a master set. Special folded cards are also used to evaluate color. Dara Horn poetically describes how diamond color is influenced by context. 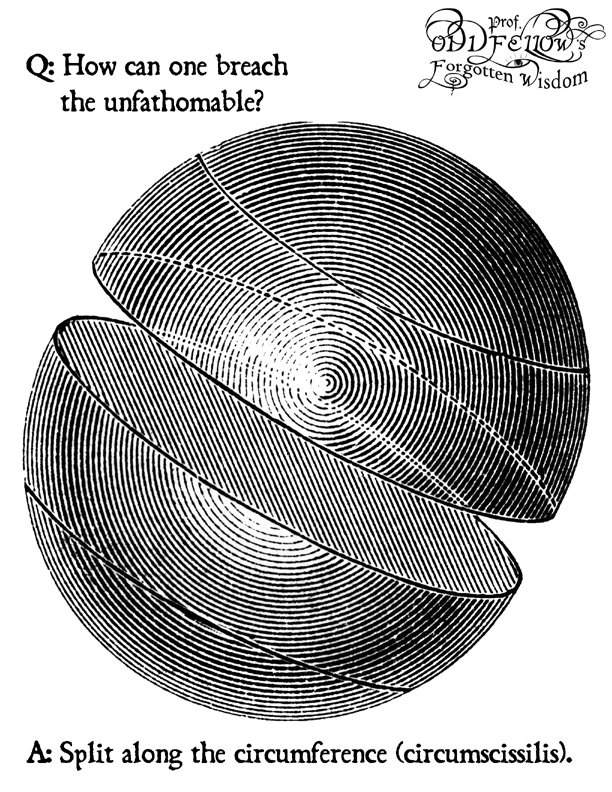 Three diamonds that look identically transparent against deep black velvet reveal their differences when placed in the crease of white paper: "The first sat tarnished on the paper, throbbing a bruised and tawny color; the second glowed a dim yellow like a dying gas lamp in an old painting. The last one, exposed and revealed, blazed burning white." Boatswain: "What did you think of Cap'n Ahab's account of his quest for the Great White Whale?" Swabbie: "I'd've followed it better had he told it in chromonautical* order." *Thanks to Codename Gimmick for coining this word and inspiring the pun. When one is put "on hold," why does the telephone operator automatically send one to the Muzak Room? Why can't one request the Solarium (for weather reports), the Library (for audio books), the Conservatory (for gardening tips), the Parlor (for live chat), the Ballroom (for toe-tapping), or the Zen Room (for silence)? I, for one, would prefer being ushered to the Secret Passage. “This trick was first chronicled in cuneiform by the Ancient Sumerians,” according to Wikipedia (2006). Piecing together the secret of Hermes Trismegistus . . .
Gareth Pugh's Spring Ready-to-Wear Collection, on Style.com. Via ffffound. Not all designers think outside the hat box. The clever baker was noted for his breadth of vision. All letters in the word must touch (in any direction), and no square may be reused. One of the 9-letter words refers to a society of amateur musicians. Is the universe truly a clockwork contraption? A close-up of the sun's surface shows how ancient humans first learned to tell time. Museum goer studying map with docent: "I've been through Impressionism, Expressionism, Deco, Nouveau, Bauhaus, Rococo, Byzantine, Renaissance, Cubism, Gothic, Minimalism, Greek, and Neo-Plasticism. But where do you house the Timeless art?" 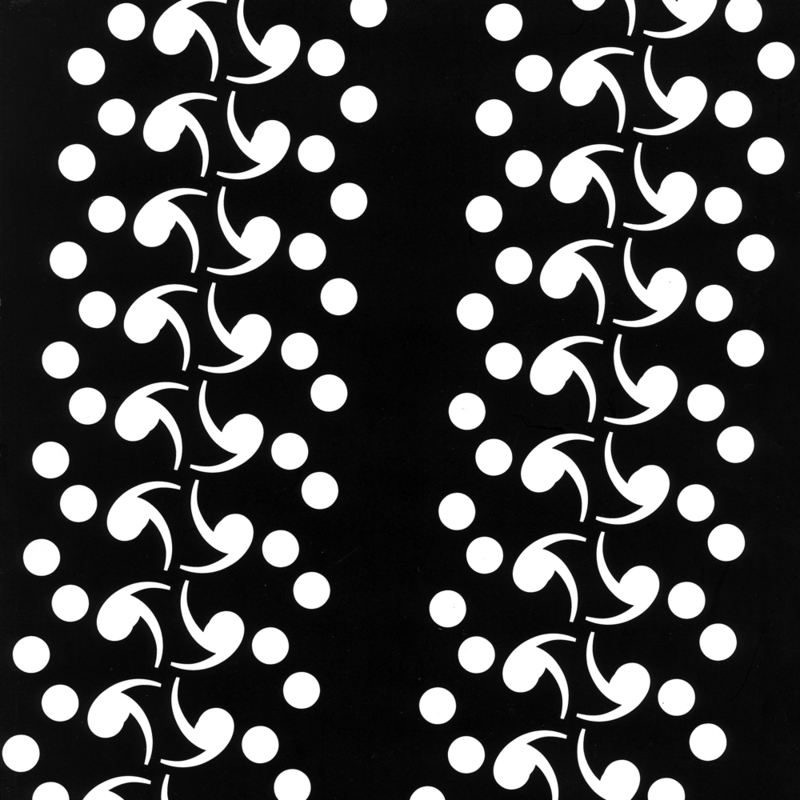 I dreamed that my DNA contained strands of the legendary two-tailed, two-dotted semicolon. Illustration by Bryan Briggs. Thank you DJ Misc. Income tax vévé by Sultmhoor. George H.W. Bush famously mocked Ronald Reagan's supply-side policies as "Voodoo Economics." Now someone has designed a Voodoo version of the Monopoly game. Here's the Income Tax square, complete with a vévé for the spirit of tariffs. The red lights are candles. Here's another view of the card. Piecing together the secret of happiness . . .